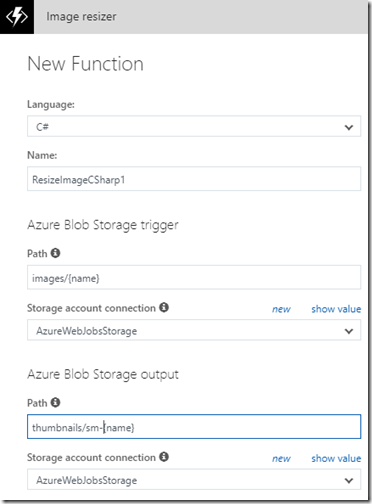 Now that you can use the Azure Blob Storage connector inside of your canvas PowerApp, you can leverage the advanced capabilities of Azure functions inside of your Azure blob storage. A common requirement is to shrink the size of an image after it is uploaded so it can be used in reports or returned to the app in a smaller size to reduce the bandwidth needed. The built-in template triggers anytime a file is uploaded to the images container. It will then create two images a small thumbnail and a medium thumbnail and put both images in the thumbnails container. The name of the thumbnail will be the name of the file uploaded with sm- or med- in front of it. The file sizes can be changed by clicking on the function name and changing the size code. By default, the small file will be 640 x 400 and the medium file will be 800 x 600. 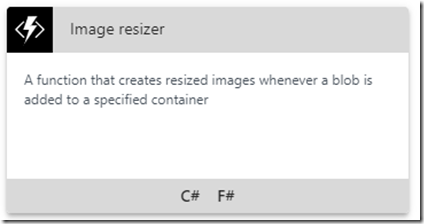 The last update will be to create your two containers for your images (images and thumbnails). 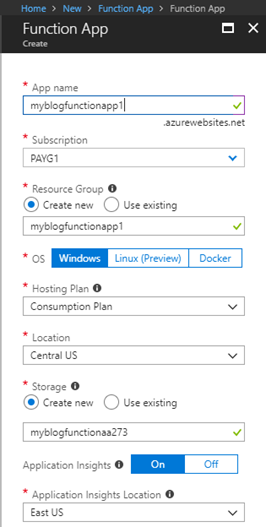 You can use the Microsoft Azure Storage Explorer (https://azure.microsoft.com/en-us/features/storage-explorer/ ) to create your contains in the new storage account that you created (myblogfunctionaa273 in this example). This is one example of how you can use Azure functions in the background of your app, let us know how else you are using them with PowerApps and if you have any questions.